Where does your kitchen inspiration come from? Today mine comes from the garden and the lessons I learned in Italy. As I have my morning coffee in the garden I’m delighted to find the most beautiful tomato’s, basil and parsley so I plan our dinner. 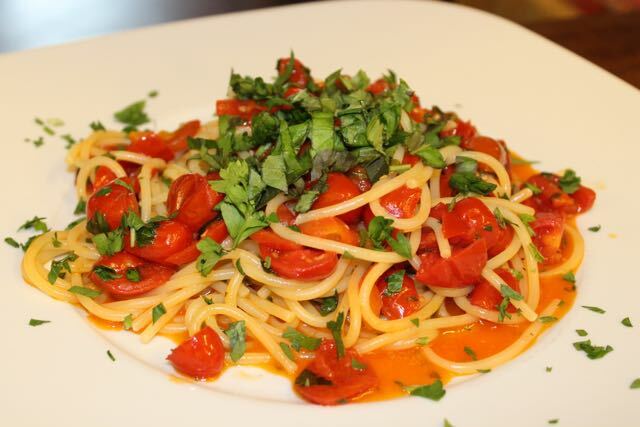 It’s a no brainer to make Pasta in Cherry Tomato Sauce. 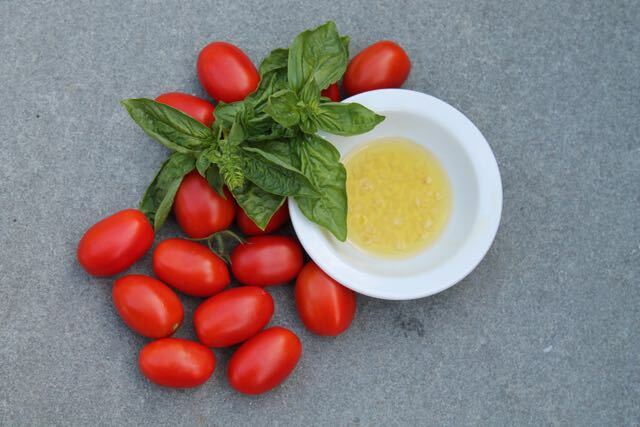 It’s the easiest of sauces, a combination of garlic, tomatoes, olive oil, and fresh basil that creates the cornerstone of the cuisine of the Amalfi coast, where my friends live. 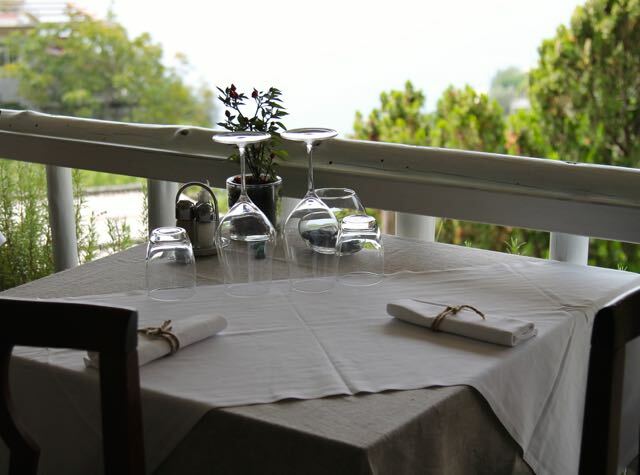 As I sit at my table by the garden my mind wanders to Il Ritrovo, perched above Positano on the Amalfi Coast. I know it’s brutally hot there, crowded with the tourists who pack the beaches, hotels and restaurants. 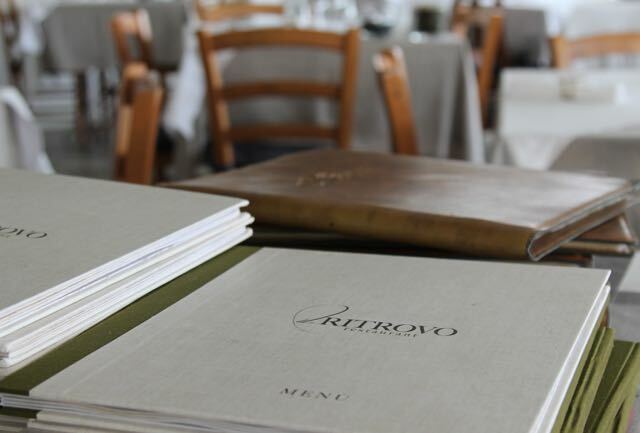 I’m thinking of my adopted family, having café with Zia Marilu, Salvatore singing to MTV in the restaurant kitchen preparing for the dinner service, then the excitement of the restaurant in full swing all evening. It’s time to go to work so I leave the garden, shake off my nostalgia and make my way through the day. When evening arrives, I make preparations for dinner. I gently heat the olive oil and adding garlic to the pan with some salt, pepper and a pinch of red pepper flakes. I savor the aroma as the gentle heat works it’s magic. I add some chopped parsley; a bit of basil and a couple handfuls of the beautiful tomatoes I picked this morning. 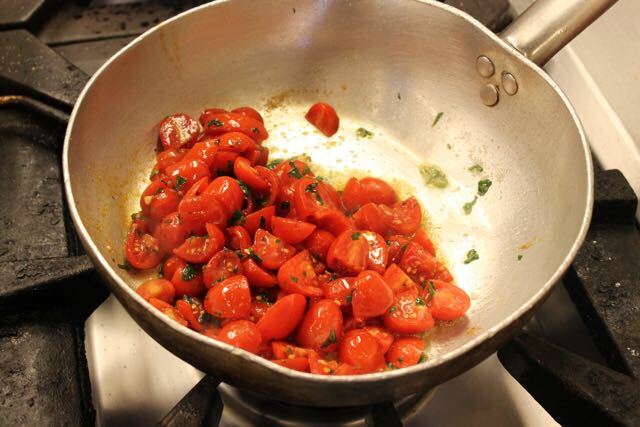 I sauté this together, melding the flavors and crushing the tomatoes a bit with the back of the spoon. The pasta cooks alongside, once it’s done I drain it, then throw it in with the tomato sauce along with a ladle of the pasta water and leave it to simmer for a few minutes. The whole process takes less than 30 minutes and it’s so satisfying. While we dine, Steve & I reminisce about our friends Salvatore, Marilu and crew. 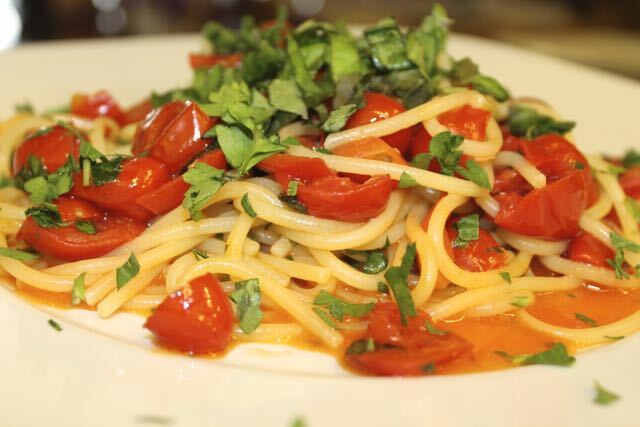 There is nothing that brings back the sights, smell and feel of Italy like this pasta, we never tire of it. Monica, I can almost see myself sitting in Italy with you. It is such a lovely country and one that I hope to go back to soon. This pasta dish is such an easy one and yet so full of flavors. To me, the scent of garlic in the pan is like a bit of heaven. Pasta is the perfect dish! 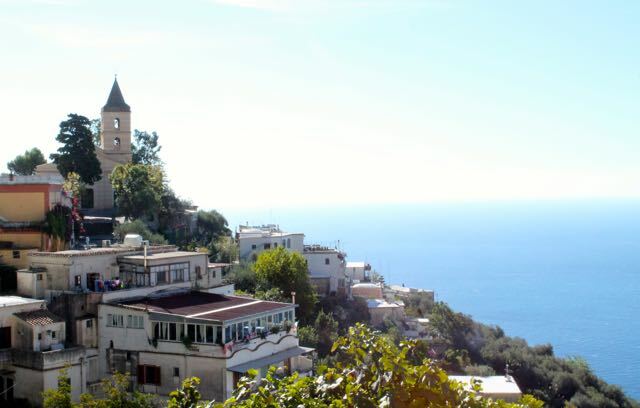 What lovely memories you must have of your time in Italy. I’m sure that enjoying meals like this bring those memories flooding back. Any kind of pasta is my go-to dish for busy weekday meals and for entertaining. Oh, thank you for that lovely mind vacation to Italy! I loved reading your story. I bet your garden is amazing. You pasta dish looks absolutely lovely. Beautiful photos! 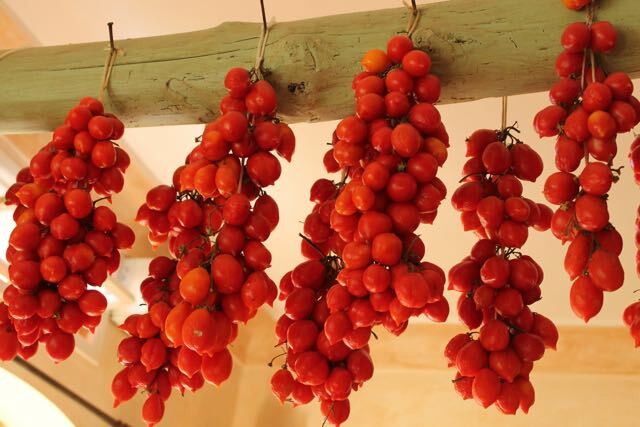 I especially like the rustic one of the cherry tomato vines hanging on nails.